One of the great Chilean traditions during the fiestas patrias and summer months is the Chilean barbecue, called an asado. The asado is more that just cooking outside. 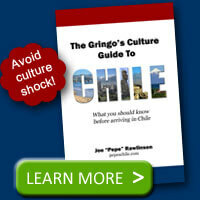 It is a social event that is a key part of the Chilean culture. Friends and family will gather frequently for asados and it is a great place to socialize. Part of the social experience is having the grill master, typically a male, tend to the grill while drinking and talking with others. The women of the house are often found inside making salads and other side dishes. You won’t find gas grills at a typical asado. The preferred method of grilling is over a wood fire and then the resulting coals. The grills range from a simple stand-alone metal grill, to fire pits with large grates placed over them. 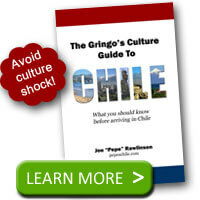 So what would you eat at a Chilean barbeque? 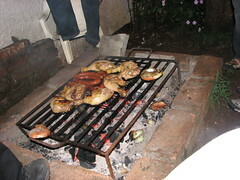 These main meat dishes are often accompanied by Chilean salad (a tomato and onion dish) and bread. If your asado is during the annual fiestas patrias, you’ll almost always experience the trifecta of chilean food: the anticucho, an empanada de pino (beef), and chicha (an alcoholic drink). 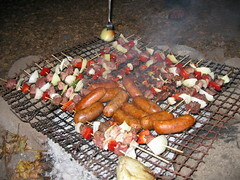 What is your favorite thing to eat at a Chilean barbeque (asado)?